Your ring size is critical when purchasing an eternity ring, as these rings cannot be re-sized. If your eternity ring does not fit, we would need to re-make a new one which can take up to 3 weeks. To avoid any delays from getting you to wear your perfect eternity ring, we strongly suggest that you double check and confirm that your ring size is correct when placing your order. For customers that do not know their ring size, Eternity Us offers a free ring sizer, just like the ones that jewelers have and use. It primarily contains little rings of all sizes that you would try on until you find the size that fits you best. After you find your correct ring size on the sizer, merely order the same size when placing the order on our website. Ring sizers are free to all our customers and will be shipped via United States Postal Service. If you are in the USA, your ring sizer will take approximately 2 to 5 business days to arrive, depending on your location. 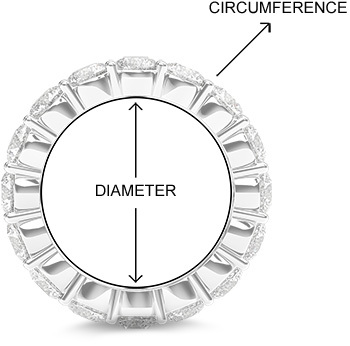 For our international customers, please expect the ring sizer to take 1-3 weeks to reach. If you want to order your ring immediately, please go to a local jeweler at a jewelry store, or department store that has a jewelry department, and get your finger measured. If you are outside the US, you may use your country's ring sizing system to provide your ring size, and we will be able to convert it to the equivalent US-based ring size for you. Please also refer to the above international ring size chart to see different country conversions. Please note: Our ring sizer will give you the correct size when used correctly. Like any tool, if misused, you will get an incorrect size. We cannot be held responsible for customers who purchase the wrong size based on using our ring sizer, or recommendations given by our customer service representatives.